I’m going to lay it out right at the start. Silent Lake Provincial Park is one of my all-time favorite Ontario Provincial Parks. As for why, I’ll get to that in a little bit. But Silent Lake PP ranks right up with Bon Echo, Killarney, and Arrowhead as an amazing getaway for solo campers, couples, or families. 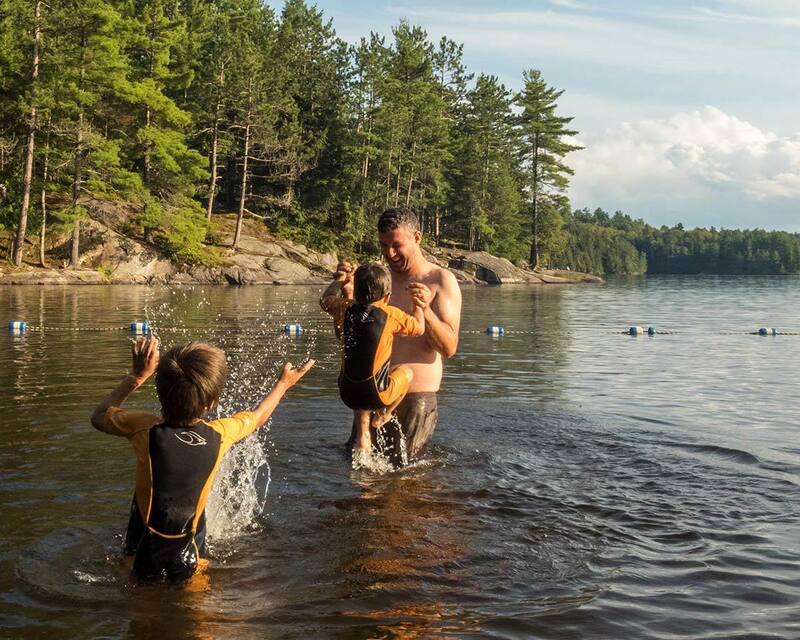 This Provincial Park near Bancroft, Ontario checks off all the bucket lists of what a great campground should be. 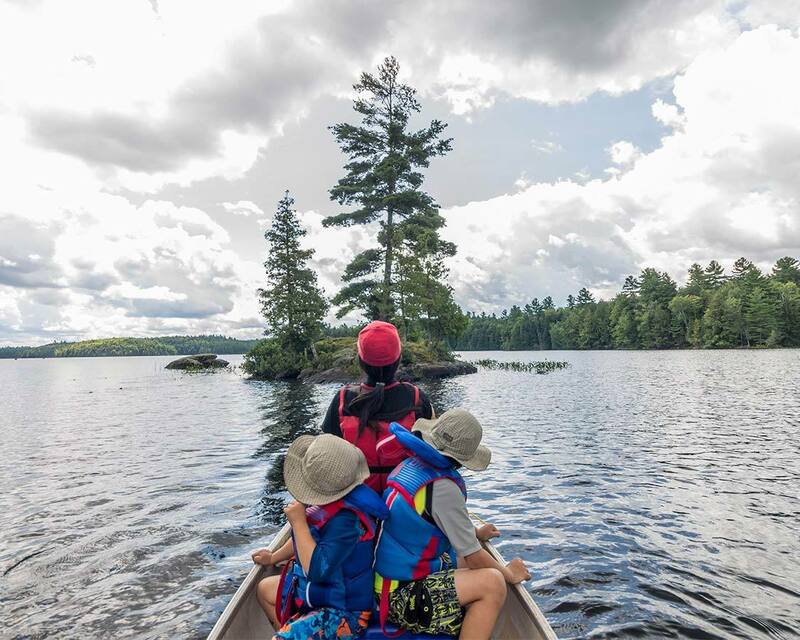 And whether you are looking at enjoying the Silent Lake yurt or campground experiences, or just go canoeing or swimming, there is a reason that the visitors to Silent Lake keep coming back again and again. Silent Lake Provincial Park was a park that was introduced to me by my oldest friend Aaron when we were teenagers. I couldn’t get over how often he raved about it. And it wasn’t just how close Silent Lake was to our childhood city of Peterborough either. Once I finally took Aaron’s bait and joined him for a weekend of camping at Silent Lake, I was hooked too. Since then I’ve returned several times myself, and it’s always a park I recommend to people looking for an amazing Ontario camping experience. Silent Lake Ontario Provincial Park is located about 2.5 hours from Toronto. 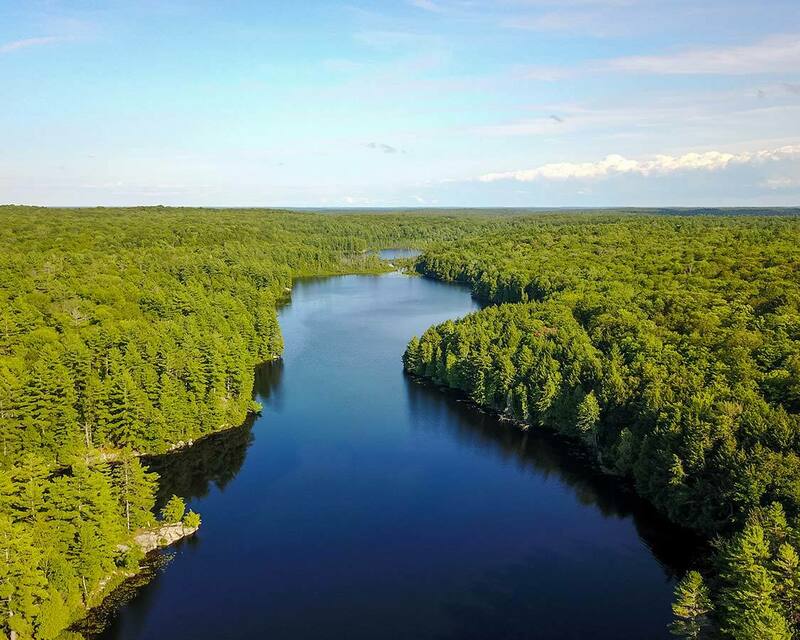 It sits about 50 minutes from Peterborough and less than 20 minutes from the picturesque town of Bancroft, Ontario. 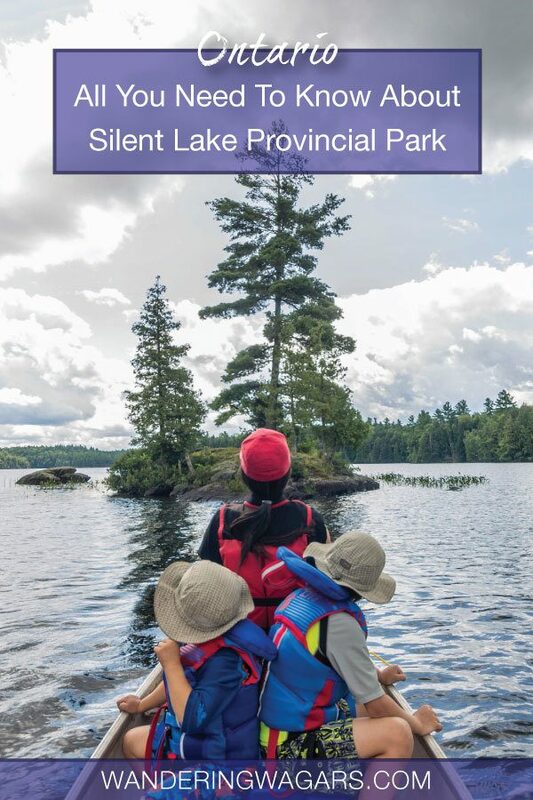 Whether you are looking at camping, canoeing, or hiking, Silent Lake has a huge range of activities for everyone. You can even take advantage of some of the Silent Lake Yurt campgrounds for some cozy accommodations. 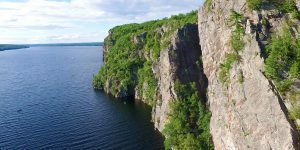 Silent Lake Ontario has great hiking and mountain biking trails and one of the most scenic lakes in Ontario. There are no motors (gas or electric) allowed on Silent Lake, so it stays true to its peaceful name. 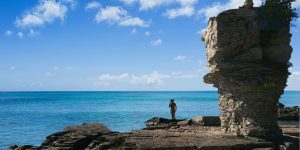 There are two beaches, and a great selection of campsites to fit the needs of novice to more advanced campers. During winter in Silent Lake Provincial Park, there is a huge selection of cross-country ski-trails like those we enjoyed in Arrowhead Provincial Park in Huntsville recently. Silent Lake is a beautiful site that I highly recommend for anyone wanting to explore the Kawartha Highlands. There are a few things to know before you go that will help make your Silent Lake camping experience as fun as possible. Book early – Campsites and roofed accommodations at Silent Lake can book up fast. 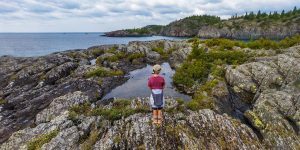 But, you can beat the crowd by booking up to 1-month ahead on the Ontario Provincial Park online booking system. You can access that here. But don’t give up – Many Ontario campsites book up early. But many also have last-minute cancellations. If you don’t mind last minute planning, keep checking the Ontario Parks site to see if there are any late openings. Sometimes this is the best way to get a prime site. Plan the weather – Watch the weather forecasts before your Silent Lake camping trip. And always prepare for the worst. You never know what could happen without warning. Pack tarps for covering your gear, mosquito repellent, and, of course,sunscreen for all that time outdoors. Don’t move firewood – This can be a hard one to swallow since the Ontario Parks aren’t known for providing the best firewood. But moving firewood from one destination to another can cause devastation. We saw this first hand in MacGregor Point where huge swaths of forest had been to cut down due to the Emerald Ash Borer beetle invasion. Silent Lake Camping is very popular. Since so many visitors return year after year, the campsites in Silent Lake tend to book up quickly. This is especially true for any of the electrical sites. The Silent Lake cabins and yurts are also very popular, especially for families and small groups. Silent Lake has a great selection of car camping and walk-in campgrounds. 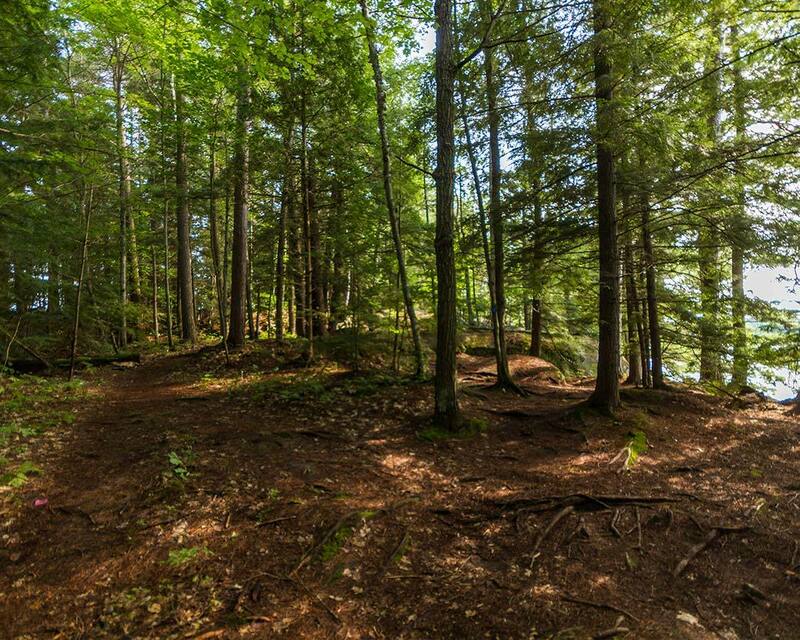 The Pincer Bay and Granite Ridge campgrounds at Silent Lake have nice forest settings with large sites. The Granite Ridge campground has a few electrical sites that book up very quickly. There are also a small number of double campgrounds with a single fire pit for larger groups. If you are looking for something a little quieter, the walk-in campgrounds in Silent Lake are where we often stay. Both Pincer Bay and Granite Ridge campgrounds have very nice walk in sites. The longest walk is about 500m, so you’ll never have to haul your gear too far. The sites in Pincer Bay can be reserved ahead of time. However, the Granite Ridge walk-in campsites are on a first-come, first served basis. If sleeping in a tent isn’t your thing, there are 10 Silent Lake cabins and 8 Silent Lake Yurt accommodations. These roofed accommodations at Silent Lake are open year-round and are a great way to experience winter in Silent Lake Provincial Park while still staying warm at night. We’ve stayed at cabins in Arrowhead Provincial Park and they are a treat. Both the cabins and the yurts are wheelchair accessible. The Ontario Provincial Park cabins sleep up to 5 people and have a screened in porch, kitchenette, dining table and chairs. Outside, the Silent Lake cabins have a bbq, picnic table, firepit and Muskoka chairs for lounging. The yurts at Silent Lake are another great way to stay in comfort. There are 8 Silent lake yurts. Each yurt sleeps up to 6 people. We did n Ontario Provincial Park yurt stay at MacGregor Point PP and loved it. The yurts have most of the same amenities and are more spacious than the cabins. But, they lack the indoor kitchenette. As beautiful as the park is, it’s the amazing things to do at Silent Lake Provincial Park that keep bringing people back each year. If you’re anything like us, you just can’t be unhappy with a day on the water. Even if you have a “rough” boating experience, you still end up with great memories and a lot of laughs. Well, Silent Lake canoeing is a must if you love the water. You can either bring your own canoe or kayak or rent one from the park during the summer. Silent Lake itself is a manageable 2.5 km (1.5 mile) long and there are no motorized craft allowed on the lake. There are also some river systems and canoe paths to explore if you want to spend as much time on the water as possible. From the park, you can also reach Quiet Lake and Soft Lake via a short portage. Our eldest son, C is a huge lover of fishing, so if you bring your fishing poles you might snag some of the massive trout that live here. 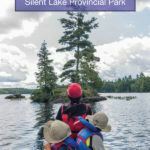 There is a great series of trails at Silent Lake for those who love to stay active during their Ontario camping experiences. During the summer the hiking and biking trails offer a combination of relaxing forest walks and challenging ups and downs to appeal to explorers of varied experience. During the winter, many of these trails are converted to cross-country ski trails. It was mountain biking that first got me excited about Silent Lake Provincial Park when I was in my teens. Where many parks tend to frown on mountain biking, Silent Lake has embraced it. There are two mountain bike trail loops at Silent Lake PP. The first is a 13 km, moderately difficult that makes for a fun, fast and entertaining ride. The second Silent Lake mountain biking trail is a 19 km loop that is considered difficult. The trail is mostly flat, however, there are some challenging ups and downs to keep things interesting. For both of the Silent lake trails, the forest offers a great ambiance. However, it can get buggy at times, especially during the early summer. Hiking is one of my favorite things to do in Silent Lake park. There are three trails that wind through the park, the Lakehead Loop Trail, Bonnie’s Pond Trail, and the Lakeshore Hiking Trail. None of the Silent Lake hikes are extreme, however, the 15 km Lakeshore Hiking Trail is considered moderate to difficult. Hiking in Silent Lake opens up the beautiful forest wilderness of the Ontario. 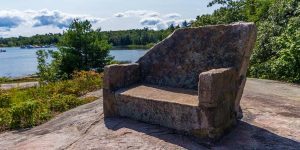 The Lakehead Loop is an easy 1.5 km hike It has a very nice lookout over Silent Lake. Bonnie’s Pond Trail is a slightly longer 3 km trail that offers a great taste of the peaceful ambiance of Silent Lake. You can’t visit a beautiful lake without having a chance to go swimming. Luckily there are two great sandy beaches at Silent Lake park. The smaller beach by Pincer Lake campground has a sloping sandy bottom and a roped off swim area for younger children and new swimmers. There is a rocky edge surrounding the bay that is often full of sunbathers and rock jumpers. The day use area is a larger beach with a shallower slope offering a lot of room for families to play. The day use area also has a large grassy field that is perfect for picnics and spending a long day at the Silent Lake beach. 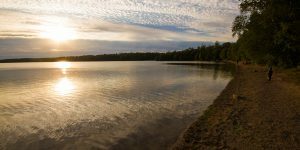 If you are spending more than a weekend at Silent Lake Provincial Park you may want to take the time to explore some of the great things to do near Silent Lake. Since Silent Lake is right among some of the most spectacular attractions of the Ontario Highlands there are many great places to explore. Bancroft Ontario is a small town less than 20 minutes from Silent Lake Provincial Park. Bancroft is famous for its local rock and gem scene. If you are visiting Silent Lake in August, it’s worth checking to see if the popular Rockhound Gemboree is going on. This huge rock and gem show takes over the town and attracts people from around the world. The rest of the year Bancroft has a lot going on as well. You can explore Egan Chutes Provincial Park, get some culture at the Art Gallery of Bancroft or visit the converted train station that now houses the Bancroft Mineral Museum. Petroglyphs Provincial Park is about 45 minutes from Silent Lake Provincial Park. 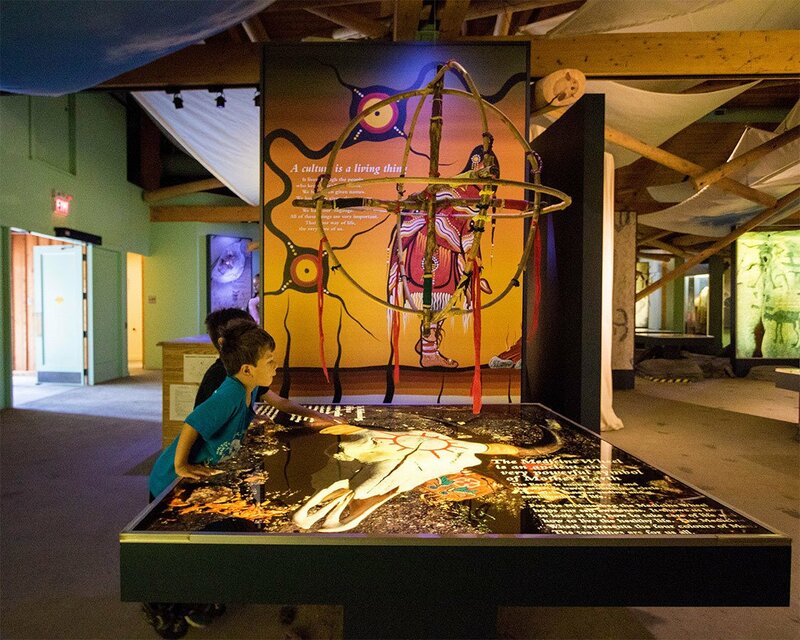 Petroglyphs Park contains some of Ontario’s most incredible indigenous history and is worth visiting for a day trip. The hiking trails in Petroglyphs PP wind through beautiful Highlands forests. But, the real gem is the collection of 500-1,000-year-old petroglyphs. 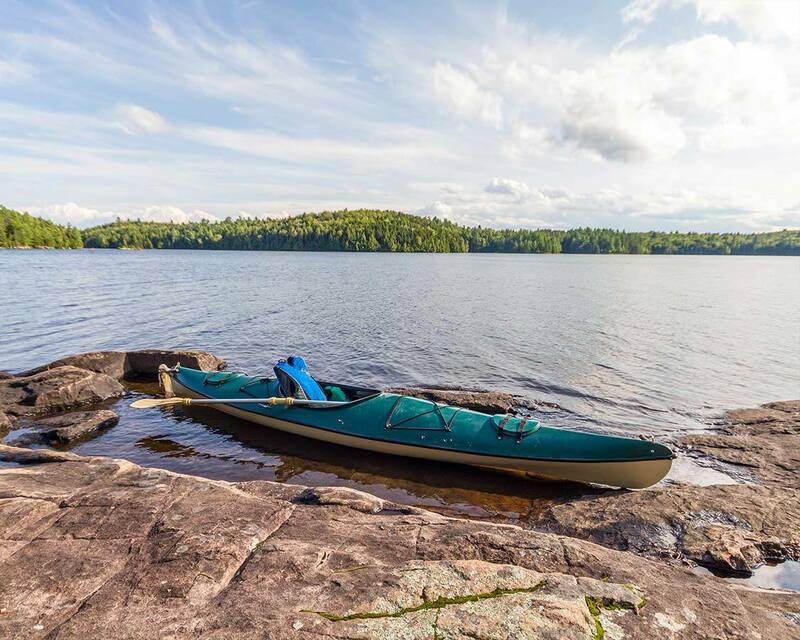 Just 27 minutes from Silent Lake is the sprawling Kawartha Highlands Provincial Park. Kawartha Highlands is second only Algonquin Provincial Park as the largest provincial park in Southern Ontario. 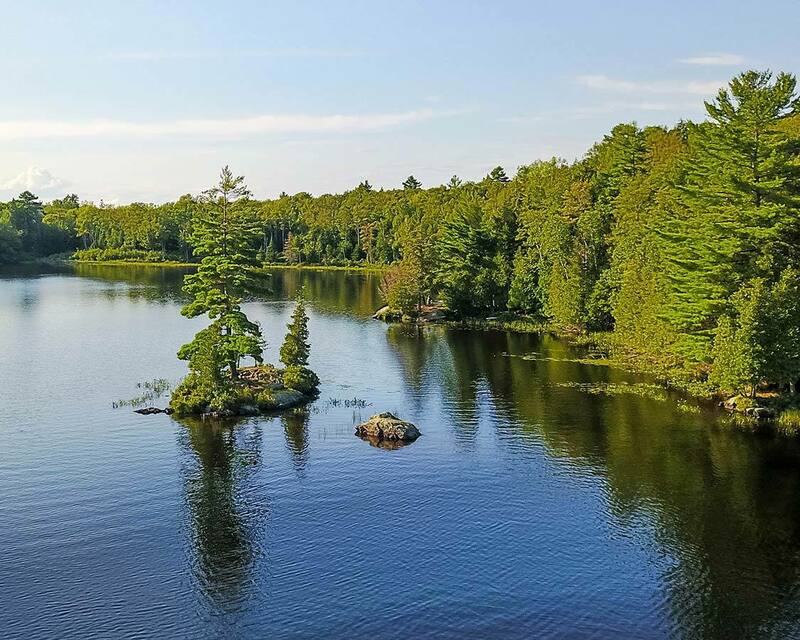 Kawartha Highlands doesn’t have many of the facilities that many Provincial Parks in Ontario have, but it does have tremendous beauty and a lot of wilderness to explore. One of our favorite places to visit here is the Bottle Lake campground. If you are looking for a great spot for family camping in the Kawartha’s, Silent Lake is amazing. 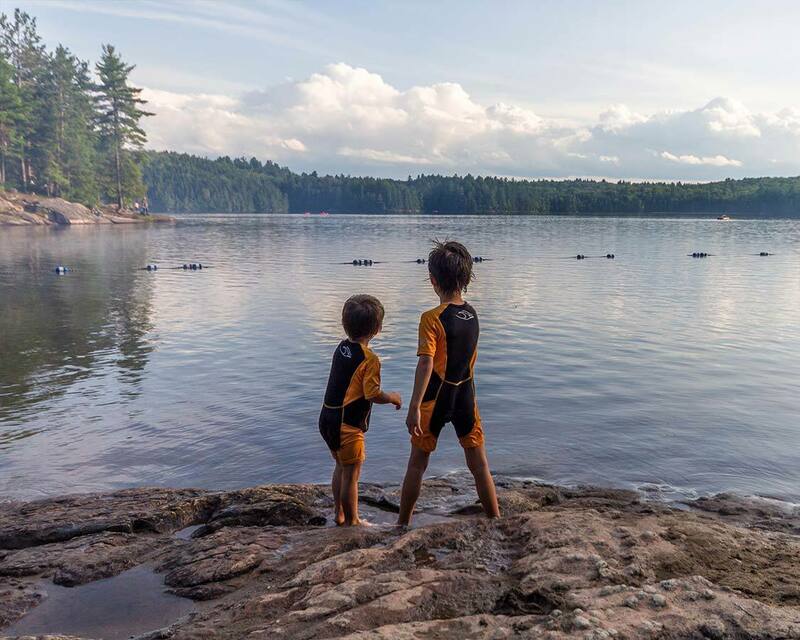 From the soft, sandy beaches and the sparkling lake waters to the amazing hiking trails and spacious campgrounds, visiting Silent Lake with kids is a treat. It’s a place we have been several times and will be visiting again as often as we can. 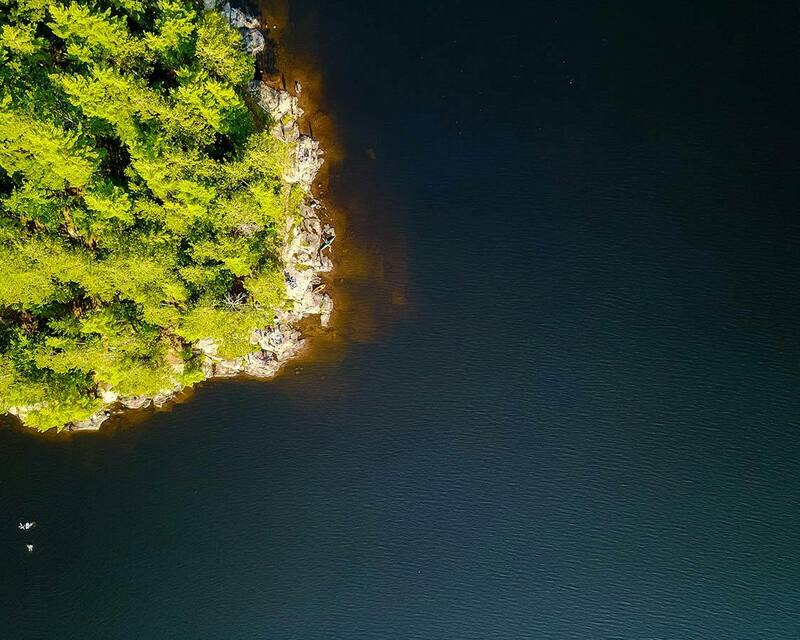 Have you ever visited Silent Lake Provincial Park? Tell us about your experience in the comments. Or, head over to our Facebook page and share a photo of your trip. We would love to share in your travels. This sounds like a beautiful place! I think we need to make a trip to Ontario. Really enjoyed your description and photos of Silent Lake, very accurate, I know, I was park superintendent of Silent Lake from 1986-1990, then again from 1996-2001. As a local, I still frequent Silent Lake each summer for day use visits , now taking the grand kids. One of the jewels of the Ontario provincial park system. What a history Ron! I’m honored to have someone with your background checking out our post.